Police stand guard after cordoning off an area in central Paris as security operations continue in the wake of the Nov.13 terror attacks, in which at least 129 people were killed, Nov. 17, 2015. French officials said late Tuesday they are seeking a second fugitive directly involved in the Paris attacks. Three officials, who spoke on condition of anonymity because they were not authorized to provide details about the ongoing investigation, said an analysis of the series of attacks on November 13 indicated that one person directly involved was unaccounted for. Seven attackers died that night – three around the national stadium, three inside the Bataclan concert venue and one at a restaurant nearby – in attacks that killed 129 people and injured more than 300 others. A team of gunmen also opened fire at a series of nightspots in one of Paris' trendiest neighborhoods, officials said. French and Belgian authorities have issued a warrant for one person, Salah Abdeslam, whose brother was among the attackers. The officials said the second fugitive has not been identified. Meanwhile, U.S. Secretary of State John Kerry said Tuesday the Islamic State group "will feel even greater pressure" in the coming weeks as the United States, France and other allies increase their efforts against the militants who claimed responsibility for the deadly Paris attacks. Kerry spoke in Paris after meeting with French President Francois Hollande and discussing different ways in which their governments can be more effective in battling the Islamic State group in the wake of the recent attacks in Paris. Hollande will meet with U.S. President Barack Obama in Washington Nov. 24 to discuss ways to ramp up efforts to target the Islamic State group, according to a White House statement Tuesday. The two leaders will discuss U.S. efforts to assist in France's investigation of the attacks and further cooperation among the U.S.-led, anti-IS coalition, the White House said, adding, "This visit will underscore the friendship and solidarity between the United States and France, our oldest ally." "We are absolutely committed to increasing our efforts in every degree possible – and thoughtfully, carefully," Kerry said. "My sense is that everybody understands that with Lebanon's attacks, with what's happened in Egypt, with Ankara, Turkey, with the attacks now in Paris, we have to step up our efforts to hit them at the core where they are planning these things, and also obviously to do more on borders and in terms of the movement of people," he added. He also highlighted recent gains, saying the militants now control only a quarter of Syria's northern border and that he is "confident the momentum will pick up." Elsewhere, German police in the western city of Aachen arrested seven people earlyTuesday, but later released them, saying no links to the Paris attacks were found. Hollande has vowed to strike “without mercy” at the Islamic State group. France launched a second series of airstrikes in two days against IS targets in Raqqa, the group’s Syrian stronghold. French warplanes continued bombing Islamic State targets in Syria on Tuesday, hitting the group's de facto capital in Raqqa. The defense ministry said 10 of its jets took part in the latest airstrikes aimed at a command center and a recruiting site. Russia did not specifically blame IS for the downing of a Metrojet last month, but within hours of its announcement Tuesday, Moscow had launched an aerial bombardment on Raqqa as well. Meanwhile, French Interior Minister Bernard Cazeneuve said Tuesday that authorities carried out 128 raids overnight. 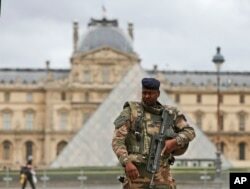 Paris police also said Tuesday 16 people have been arrested and detained in the region since Sunday in relation to the attacks, and six firearms have been seized since a state of emergency was declared on Saturday. Officials have identified the suspected mastermind behind Friday's deadly attacks: a Belgian national of Moroccan descent, Abdelhamid Abaaoud. Belgian authorities had sought Abaaoud earlier this year for a foiled terror attack on police. Police also continue to search for the suspected “eighth” assailant, identified as Belgian-born Abdeslam. A third Abdeslam brother, Mohammed, was briefly detained over the weekend by police. Speaking with a French television station Tuesday, Mohammed Abdeslam said, "We're family, we're thinking of him, we're wondering where he is, whether he's scared, is he eating. ... The best outcome would be for him to turn himself in so that judicial processes can shed light on this story." While authorities believe that there were only eight actual attackers – seven of whom were killed – they think about 20 people were involved. Also Tuesday, investigators identified the voice of a French jihadi convert, Fabien Clain, 36, of Toulouse, on the Islamic State claim of responsibility for the Paris strike. Clain is suspected of having been behind a failed attack on a church in the Paris suburb of Villejuif early this year. In a rare address to both houses of France’s parliament in Versailles on Monday, Hollande said Friday's "acts of war … were decided and planned in Syria, prepared and organized in Belgium, [and] perpetrated on our soil with French complicity." 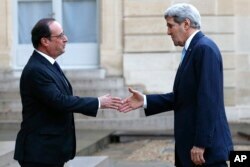 Hollande called on the United Nations Security Council to rapidly issue a resolution against terrorism. He also called for building a coalition to defeat IS. In addition to meeting with Obama, Holland's office said Tuesday he would meet on Nov. 26 with Russian President Vladimir Putin, whose country confirmed Tuesday that terrorism caused the crash of a Russian airliner over Egypt. A soldier patrols in the courtyard of the Louvre Museum in Paris, Nov. 17, 2015. France made an unprecedented demand on Tuesday for its European Union allies to support its military action against the Islamic State group. In Geneva, the United Nations urged European countries to refrain from blaming or demonizing refugees following the attacks in Paris. "We are concerned about reactions by some states to end the programs being put in place, backtracking from commitments made to manage the refugee crisis or proposing the erection of more barriers," U.N. refugee agency spokeswoman Melissa Fleming said. Speaking on French radio Tuesday morning, Prime Minister Manuel Valls said authorities still don’t know if there are accomplices in France and Belgium – or the number of people involved in the attacks, suggesting there may be other assailants on the loose. Meanwhile, security in France has been sharply ramped up. Soldiers have been patrolling Paris streets for months – ever since the last set of terrorist attacks, in January. The government now says about 115,000 police, gendarmes and military are mobilized across the country. Chris Hannas contributed to this report from Washington. Some material for this report came from Reuters.